Knowing I wouldn't get home in time to catch any daylight for an outfit post, this photo was taken outside of my office, and you can see the wonderful drive thorough of the walgreens next door in the back ground. I hated to go back in after this, it was 80 degrees and just beautiful out! I'm happy to have finally fisnhed one of my four items! I do love this skirt, but I'm a bit tired of it now. 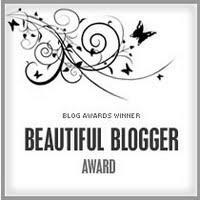 Also, I have received the Beautiful Blogger award from Blessed are the Meek - Thanks so much!! 1. Thank and link to the person that gave you the award. 2. Pass the award on to however many bloggers who you have recently discovered and who you think are fantastic. 4. State seven things about yourself. OMG!!! An award! YIPEE!! Thank you, Lyddie! I love how you showed all the ways you've styled this skirt. AND, LOVE the straight-forward outfit post! Keep 'em coming! PS - we are in the same time zone! I'm going to bed. LOL. Aww - I like that picture- Walgreens drive through background or not. I know what you mean about being kind of sick of the skirt. I am not sick of yours, I love the looks you came up with! But, I think I got kind of sick of my picks! I love the last outfit! I think you were very diverse and wore the skirt well! I'm getting tired of my picks too! I love this outfit though, I think it's my favorite pencil skirt outfit! Oooh you are sooo sweet girl! I wish I could give this back to you, but that would kind of go round in circles, eh? Haha. Thanks, sweetie, you're gorgeous! And you look so adorable in that first pic - made me smile. I really love that skirt, beige is such a great versatile colour. My favourite look is the last one but I am in love with those green tights in the first picture. I really would like a pair exactly like those. You look so great in that pencil skirt. I'm glad it made it into rotation for the challenge. You may not have too diverse, but you look classically beautiful in each outfit. I really like that skirt - I think the third look from the top is my favorite; love it with red! You're braver than I am! I get all kinds of insecure when I try to hang outside and take photos. the skirt is so wonderful! great color too! You're tired of the skirt??? I like it on you! I think your looks have been pretty diverse. Very versatile indeed! I liked looks 3 and 4 the most. looks gorgeous out, I am ready for some sun!! the skirt looks amazing on you! The second look was my favorite. I love how you made something that I consider to be corporate like a pencil skirt look casual. Also, coffee is a food group. Good call. I love the green tights! They make the outfit so eye-catching! Would you wear a waist bag?